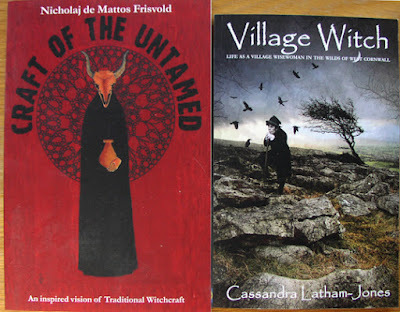 I'm really looking forward to reading these two books on traditional witchcraft that I've been sent to review. They are both from Mandrake of Oxford. One is called Craft of the Untamed and is described as "an inspired vision of Traditional Witchcraft". It is by Nicholaj de Mattos Frisvold. The second is called Village Witch. It is by Cassandra Latham-Jones and is about life as a village wisewoman in the wilds of west Cornwall. The books were sent to me by Mogg Morgan of Mandrake of Oxford, who also let me know a talk called Surrealism and The Occult by Nadia Choucha, which is on at Treadwell’s in London on Tuesday 13 December. All of these titles can be ordered through Mandrake of Oxford, Treadwell's Bookshop or Amazon.